Are you looking forward to a new comic book but it’s impossible for you to wait for its release before you know what we thought about it? That’s why there’s DoomRocket’s Advanced Reviews—now we assess books you can’t even buy yet. 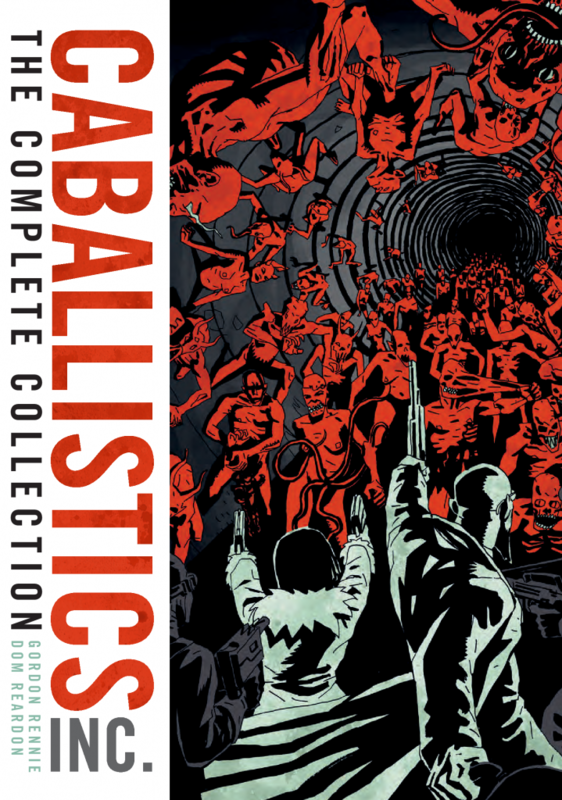 This week: ‘The Complete Caballistics, Inc.’ TPB, out in the UK 21 February and in the U.S. February 21 from Rebellion Publishing and 2000 AD. THIS REVIEW OF ‘THE COMPLETE CABALLISTICS, INC.’ IS SPOILER-FREE. by Brendan Hodgdon. For the uninitiated (like myself), it is easy to gloss over venerable British comics magazine 2000 AD as the home of Judge Dredd and Rogue Trooper and not much else. But it would be downright silly to forget that those hallowed pages have played host to a stunning variety of terrific stories over the decades. Nothing proves that point better than The Complete Caballistics, Inc., a hefty tome of pulpy occult delights collecting and properly completing the entire serialized epic from writer Gordon Rennie and artist Dom Reardon. The premise of Caballistics, Inc. is grade-A high-concept procedural fun: in the early 21st century, a British government agency dealing with occult threats is bought up by a billionaire and turned into an independent monster-hunting group. 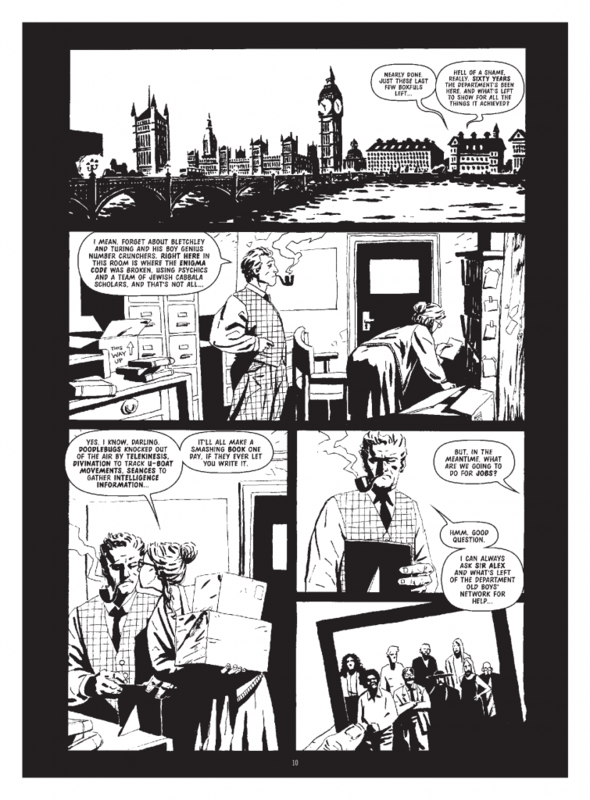 In the execution, you can see a resemblance to the work of Warren Ellis and Mike Mignola in equal measure. But Rennie & Reardon’s work is so seamless and carefully orchestrated that it becomes a magic act; you don’t notice how well it’s done, precisely because it’s done so well. At the core of it all is the characters, who are established in broad and functional terms from the jump and are smartly layered over the course of the book. 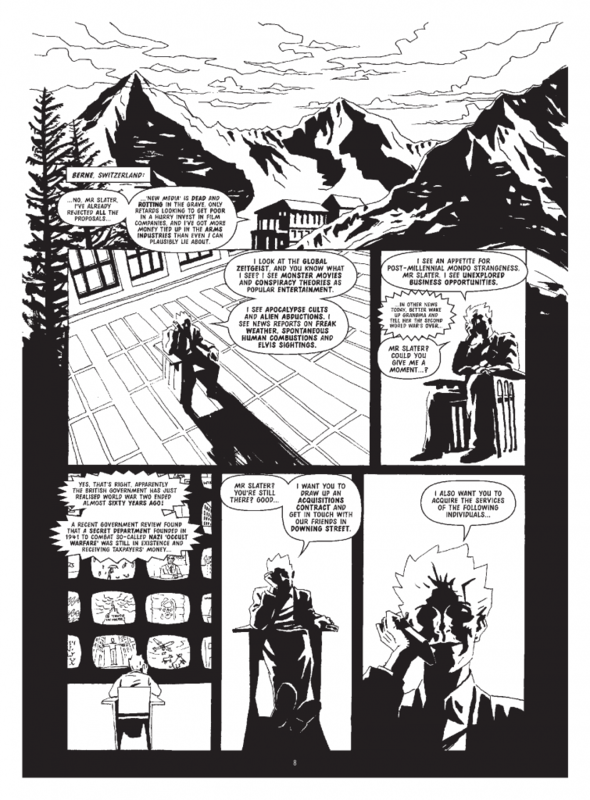 The ex-government academics Jonathan and Jenny, the mercenary demon hunters Chapter & Verse, slimy occult expert Ravne, cold-hearted lawyer Slater, vicious ex-soldier Ness, rich ex-rocker Kostabi; every character is distinct even on the surface, and Rennie’s script gives them all their share of nuance as it goes on. Reardon’s character designs are hugely important here; they give the team a sense of variety in their appearances, which goes a long way in selling their emotions. The extended serialization that comes part and parcel with 2000 AD’s publishing method translates very well to this massive collection. There is a comfortable ebb and flow to the narrative, as chapters will shift from intense action extravaganzas to more subdued, character-oriented affairs. There are multiple story threads throughout, and whether the focus of the story is violence or conversation Rennie & Reardon keep everything moving forward. The amount of spontaneity that’s pumped into Caballistics, Inc. is beneficial in keeping this creative team’s efforts fresh and engaging. The cases the team takes range from historical British occult societies to traditional-for-the-genre Nazi conspiracies to modern disruptions like Desert Storm and the Mossad. They mix and match the team in both social and tactical circumstances as well as splitting them off alone, and they establish intriguing long-term threats in a way that never grows tiresome. The sheer scope on display here—the worldbuilding, character development, and great design work—is truly impressive. Perhaps one of the great accomplishments of this book is how each individual chapter stands out on its own, even while read as part of this mammoth whole. A personal favorite for me was “Creepshow”, where the team investigates a haunting at an abandoned B-movie studio. The story serves as the culmination of several threads from the series up to that point and pays them off beautifully, upending and reshaping the status quo for the next stretch of the story. It also shows a lot of inventiveness in terms of setting and structure (not to mention a few metatextual elements for cinephiles like myself). This concept gives Reardon room to really let loose, and he delivers a glorious array of gorgeous scenery and exciting monster designs as a result. It’s a standout chapter that summarizes what makes this entire collection so killer. Reardon’s art is consistently great, in both the action-driven segments like “Creepshow” and the quiet, slowed-down chapters. His heavy linework gives everything weight, and blends nicely with the thick inks to give everything a suitably moody vibe. There are a lot of truly absurd images (a priest fending off demonically-possessed dead people with a chainsaw, for instance) that nevertheless need to remain intense, and Reardon walks that line with ease. 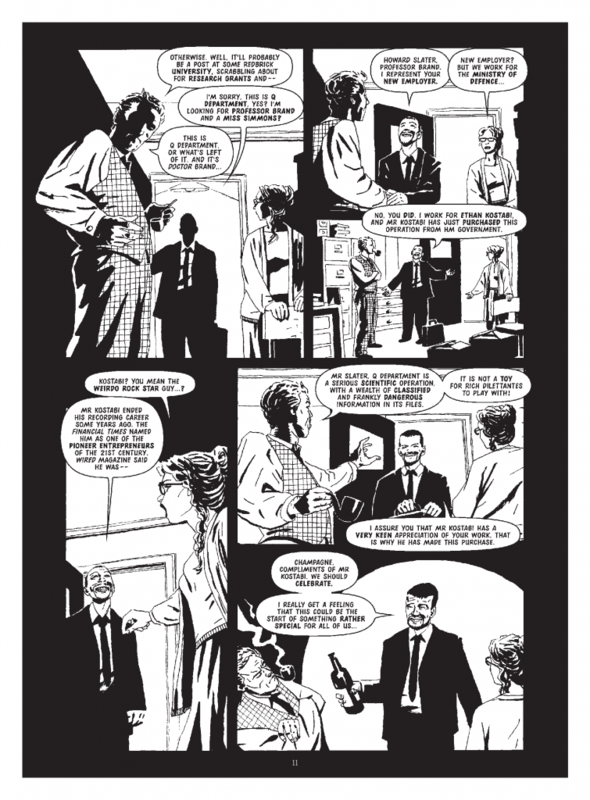 And the rotating cast of letterers, including Tom Frame, Ellie De Ville and Annie Parkhouse, lend a rough, indie edge that supports the pulpy energy of the book. Sometimes it’s easy to forget how expansive the world of comics really is, and how there is so much great work being done outside the myopic context of the American direct market. The work that Gordon Rennie and Dom Reardon did in Caballistics, Inc. is remarkable, and deserves a place on the shelf with other more recognizable tomes. Perhaps the one downside to this volume is knowing that it’s the “Complete” story, and that there aren’t more collections on the horizon. But being such a composed, absolute story as it is, there is no way that you’ll come to the end of The Complete Caballistics, Inc. anything less than satisfied with the total package. Letters by Tom Frame, Ellie De Ville, Annie Parkhouse. 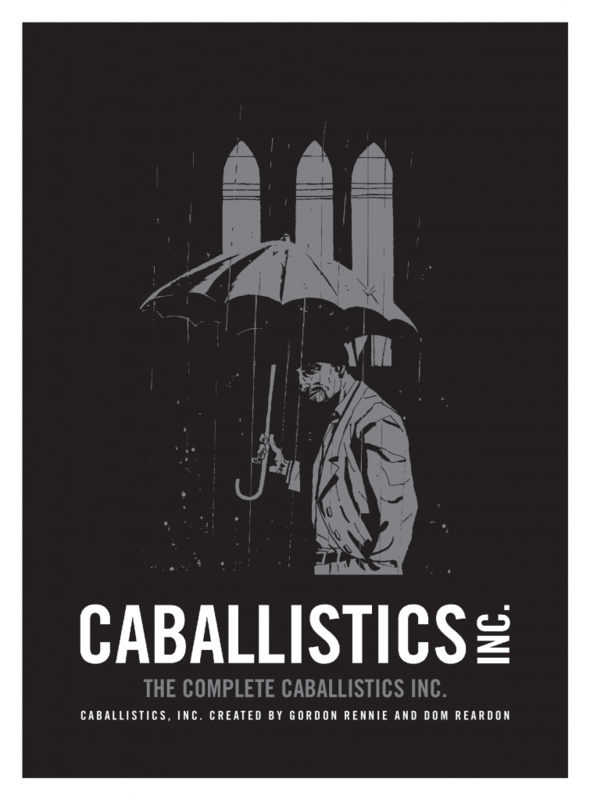 ‘The Complete Caballistics, Inc.’ TPB hits UK shops 21 February and in the U.S. February 19. 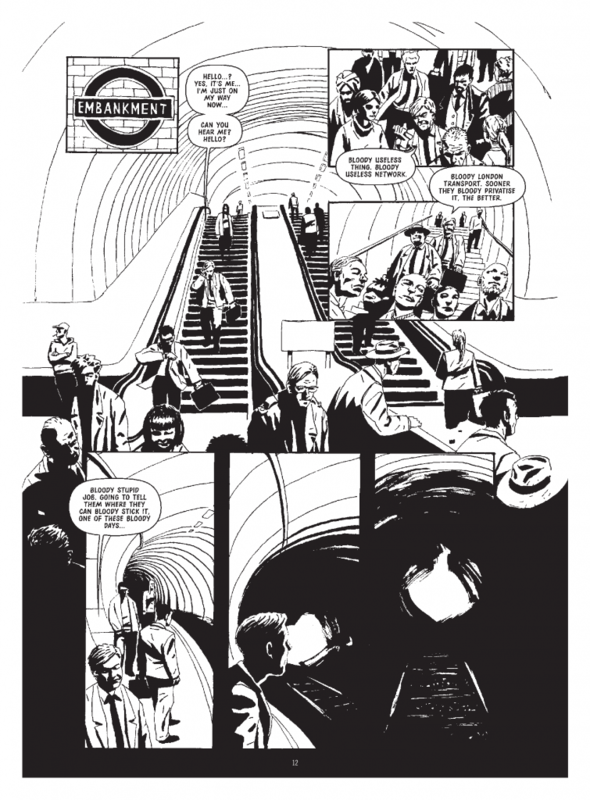 You can pre-order it from the 2000 AD shop now. 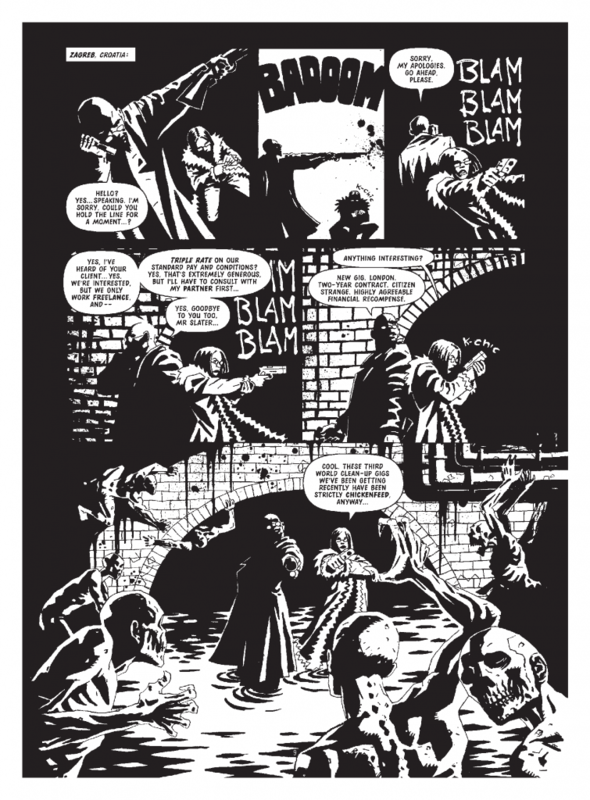 Check out this six-page preview of ‘The Complete Caballistics, Inc.’ TPB, courtesy of Rebellion Publishing and 2000 AD!